Alex’s wife the option of restoring his body with their latest and greatest robotic counterparts. What could possibly go wrong? 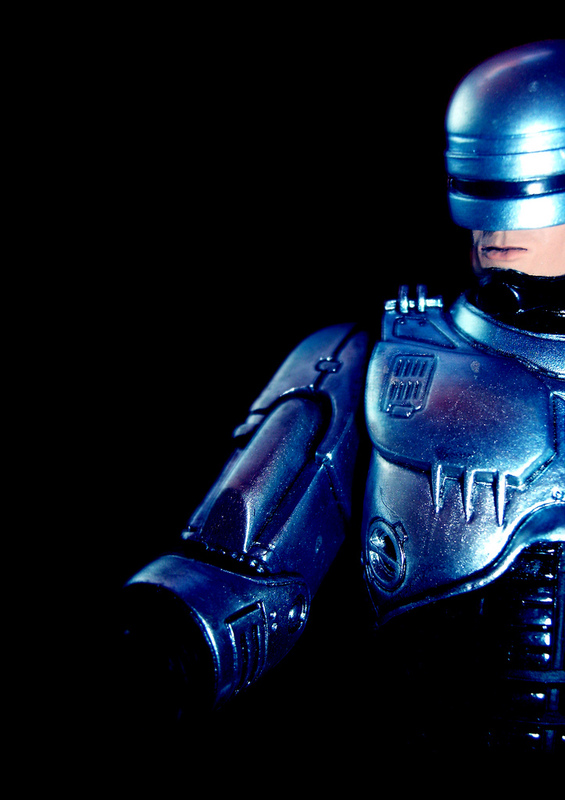 RoboCop does an excellent job of being more than just an action movie. Yes, there is action (and it is awesome), but RoboCop also brings up topics like the power and ethics of corporations, the value of family and even some political ideas such as whether America is on track to become the world’s kindest bully. Another thing that this movie excels at is showing internal struggles. The main character has had nearly his entire body replaced with artificial counterparts, and he struggles with whether or not it is really him any more or if life is worth living. Alex also struggles with self-determination and free will. Other positive elements include Alex’s devotion to his wife, her devotion to Alex, their devotion to their son and a scientist eventually taking a stand for what he believes is right. The worst language is bleeped out (it is during a television show), but the rest is still there and includes everything that is allowed without making the movie R.
Gore: Seeing the main character with his wounds after he was blown up was graphic. Also, viewers see him multiple times in his final reduced form (brain, face and lungs). Plus, because he is a nearly invincible cyborg now, Alex engages in multiple gunfights in which he kills just about everybody. Questionable scenes: As far as sexuality goes, in one scene Alex and his wife begin to undress, but they are interrupted by a car alarm. It is an okay movie. The action kept it lively, but it was not constant. Although some of the themes that emerged were a nice surprise, the lack of any deeper layers will probably keep people from seeing this movie multiple times. It is a good choice for one-time viewing. Interestingly robotics in humans has been around at least since Shelly’s Dr. Frankenstein. And it has been in development phase about as long as nuclear fusion for electricity generation. So far both have proven elusive. Every few years a “breakthrough” is announced (to keep the media enthralled and public grant money flowing) but then nothing really ever happens. And at least as farv as robotic implants go it is rather unlikely that human invention can outwit processes that, if evolution is to be believed, took millions if not billions of years to get “just right”.